LOS ANGELES — The TV ratings were up, but some people wondered if Ellen DeGeneres #overdidit with all the #socialmedia at the #Oscars2014. 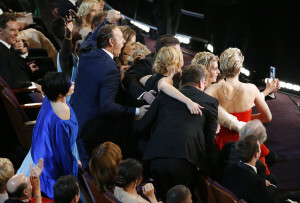 Sunday’s 86th Academy Awards telecast on ABC broke with tradition and reverse-engineered itself for the Twitter generation, with host DeGeneres returning after a seven-year hiatus to order in pizza as a joke for the attendees and, in the night’s most familiar image, tweeting out a selfie posed with Bradley Cooper, Meryl Streep, Angelina Jolie and other stars. The gambit appears to have worked: An average of 43 million total viewers tuned in to TV’s biggest awards show, according to Nielsen. That was up 6 percent compared with last year’s much-criticized ceremony hosted by “Family Guy” overseer Seth MacFarlane. 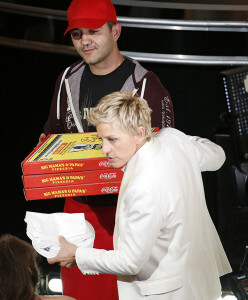 ABC estimated that nearly 72 million viewers overall watched at least six minutes of the program. 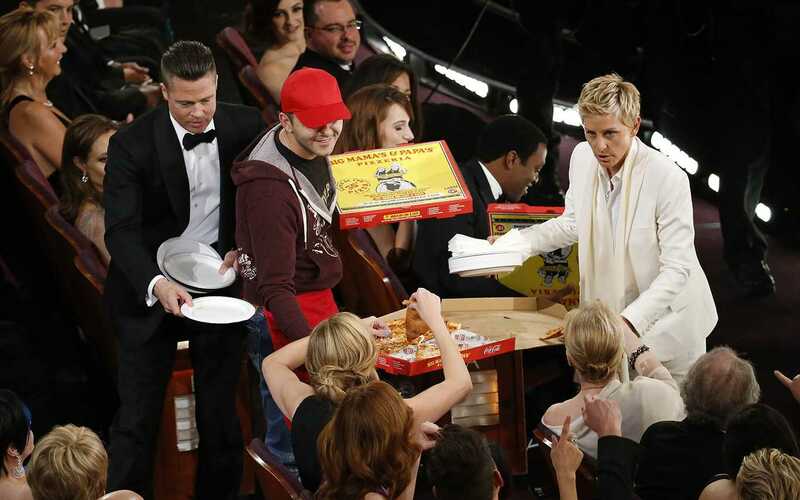 In the key demographic of adults ages 18 to 49 that largely determines the rates advertisers pay for commercial time, the Oscars earned a 12.9 rating, essentially flat with last year’s 13.0. 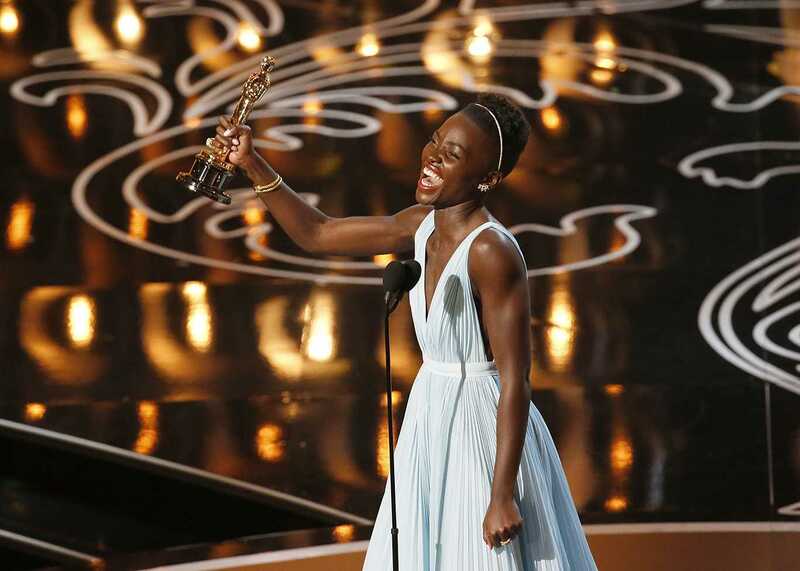 Among men under age 35, the ceremony climbed 4 percent and it was up 8 percent in teens. 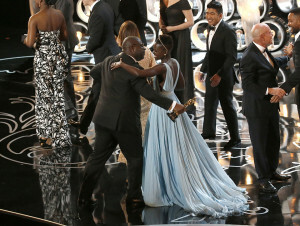 But it was in the world of Twitter and social-media sharing where these Oscars — beamed live from the Dolby Theatre in Hollywood — really shone. During the telecast 11.2 million tweets poured forth from 2.8 million unique users, according to Social Guide — a 75 percent increase from last year’s activity. 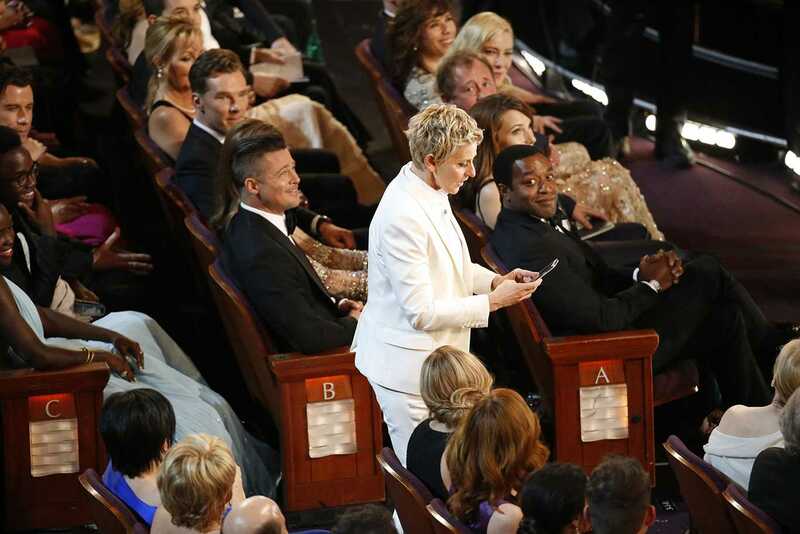 In taking her selfie with Streep and the others, DeGeneres invited viewers to retweet the image. It became the first image to be retweeted more than 2 million times, briefly crashing the microblogging platform. 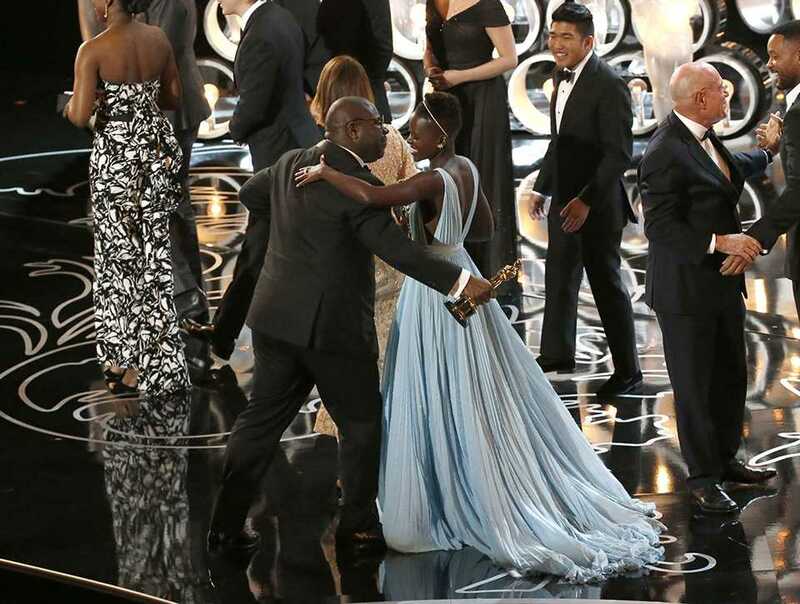 After such a stunt, the ultimate best picture win for the historical epic “12 Years a Slave” seemed almost anticlimactic. 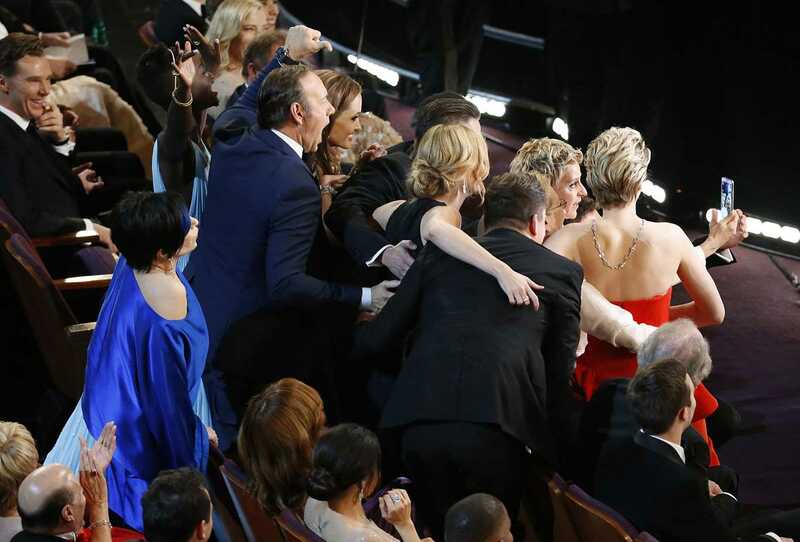 “That was really gold, that was beautiful,” Steve Minichini, chief innovation and growth officer at ad firm TargetCast, said of the star-studded selfie. “It was a great example of how social media can be incorporated into a live telecast, encouraging viewers to tune into the show and take part in it,” said Brad Adgate, an analyst for Horizon Media in New York. Of course, it’s hardly certain that social media deserves the credit for Sunday’s viewership gain. “Gravity,” one of the best-picture nominees, was a bona fide box office hit, grossing more than $270 million in North America alone. The promise of celebrities such as Sandra Bullock, Brad Pitt and Jolie striding through the aisles at the Dolby didn’t hurt the tune-in either. 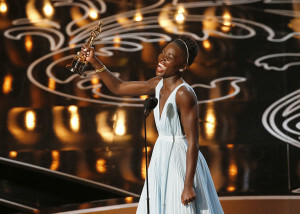 The Oscar producers sounded satisfied on Monday. But in a paradox that points out the difficulties in trying to appeal to audiences on multiple media platforms these days, the Twitter stunts may not have necessarily made for great TV, Minichini added. Whether an event counts as great TV, however, may matter less and less these days. Increasingly, the big ratings go to live shows that know how to capitalize on stunts and heighten suspense on social media — exactly the playbook DeGeneres and the Oscar producers used on Sunday. This year’s Golden Globes was the most-watched in a decade, with 20.9 million tuning in to see the tweet-worthy antics of co-hosts Tina Fey and Amy Poehler. The Super Bowl set a record of 112 million total viewers. And the just-concluded Sochi Olympics on NBC drew more than 21 million viewers for 17 straight nights. 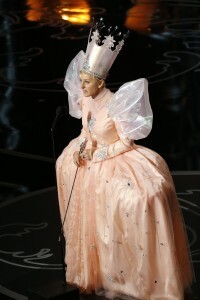 The Oscars now seem to have ridden the same wave. And that means there will likely be more to come, Minichini said. Sunday’s selfies may “be a good formulaic approach for hosts and drive what kind of stunts they pull” in the future, he said.